Inside a packed high school auditorium Monday night, incumbent Mayor Vincent Gray faced an outspoken crowd of D.C. parents and teachers eager for change in the city's education system. 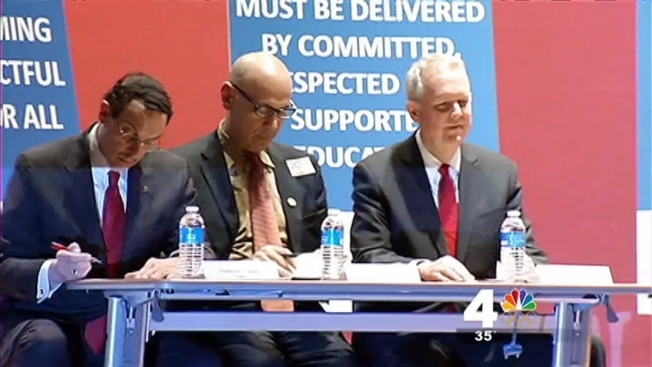 The forum, sponsored by the Washington Teachers' Union, was attended by Gray and six other Democratic candidates. The ground rules prohibited any questions about the criminal investigation into the $655,000 shadow campaign conducted on his behalf in 2010. "We're going to talk about education tonight," Gray told News4's Chris Gordon before the forum began. "We've answered a lot of questions [about the 2010 campaign]. "We're going to talk about education tonight," he repeated. Gray was asked the first question of the evening -- what his criteria is for selecting a schools chancellor. His appointee, Chancellor Kaya Henderson, plans to close some schools in the District. "That was a bed decision," a member of the crowd yelled. Gray later touted test scores, but his speech was cut short by a timer. Busboys and Poets owner Andy Shallal described the District as a "tale of two cities," marred by racism. "If I am mayor, we will not close schools," Shallal declared, as the crowd erupted into applause. "I'll put the 'public' back in public education." Council member Tommy Wells echoed Shallal, "This administration has closed nine elementary schools," Wells said, pointing to Gray. City contractor Christian Carter told the crowd he would give the D.C. Public Schools an 'F' grade. "We have a chancellor not in touch with the people in these communities, Mr. Gray" Christian told the crowd as he approached a seated Mayor Gray who looked away. "We have a lot of people who have been put into the position where they can't even afford to take their children to school." The event got even more heated members of the crowd began asking questions. Parent Shannon Smith asked the candidates to reopen Ferebee Hope Elementary School. "I don't feel that any of them gave me an answer," Smith said. Council members Jack Evans and Vincent Orange were also present at the debate, as was former State Department official Reta Jo Lewis. Council member Muriel Bowser declined due to a prior engagement.